If you're like me, you go to Jumbo, pick out a Christmas tree, strap it to an IKEA cart, bring it home on a bus, drag it up the steps to your apartment building, endure stares, endure bruises, and think nothing could be harder. But after you decorate it and enjoy the sparkly 100 Franc lights (what is with the prices of Christmas lights? ), it's all worth it. Until you realize that the tree is only festive for so long. Yes. You've seen them. Those sad, balding pines sagging against metal railings on various Swiss balconies across the country. It's practically March, but yet it appears that some people are still celebrating Christmas. I am one of those people. 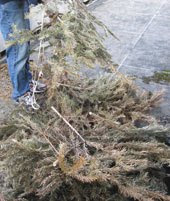 Usually, I end up celebrating at least six months of Christmas as my husband and I debate how to get rid of our Swiss Christmas tree upon missing the one tree pick-up delivery day. Here's a hint to our strategy: a Swiss army knife and a garbage bag. (Just don't tell the Swiss police, I have a feeling this is sehr illegal). To read more about how I celebrate the six months of Christmas, click here to read my expat adventure column in Swiss News this month. Your article was hilarious. My parents and I literally just returned with a tree, from Zurich's Frischbaum program. And, if I read my 2010 trash calendar properly, in Zurich in January you can put your tree against your dumpster to be picked up. Thanks Kelly. Good to know about the tree thing for all you out there in Zurich! Had my first Christmas last year with an artificial tree - hard to get the real thing in Bahrain - and it's absolutely NOT the same thing. So treasure your tree for as long as you can. Even if it means resorting to the army knife again. Yeah, somehow we just couldn't go artificial even though it would be a lot easier! But I guess if we had no choice we would deal with it. I can just see you whittling a tree while watching Lost or something. LOL!